Krish(Siddharth) and Lakshmi(Andrea) are a couple who lead a happy life together. One fine day, a lovable family join them as their neighbors. As time passes by, one of the family members, Jenny, gets transformed into an evil spirit and starts troubling everyone badly. Who is this evil spirit? Why is it targeting the family? and how does Krish handle this entire situation? To know the answers to all these questions, you need to watch the film on the big screen. Gruham (2017) Krish(Siddharth) and Lakshmi(Andrea) are a couple who lead a happy life together. One fine day, a lovable family join them as their neighbors. As time passes by, one of the family members, Jenny, gets transformed into an evil spirit and starts troubling everyone badly. Who is this evil spirit? Why is it targeting the family? and how does Krish handle this entire situation? To know the answers to all these questions, you need to watch the film on the big screen..
movie is an horror action from recent movies siddarth action is good and to watch it agai in this film .first half is an calm and good screenplay impact on story and screenplay makes movie to watch an intereste to all audience so over all its an entertainer from all team. moive from siddarth as back again with some horror action ,here movie story is nice and acion from cast also good to watch first half is an calm and cool and here interval back and climax is good to watch .over all its an entertainer . 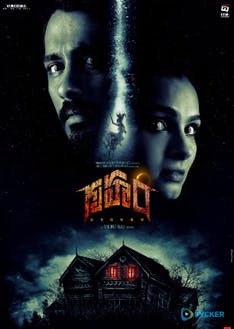 gruham an horrror movie from siddarth .here movie is an thriller direction by director,story is an devil feeds an girl and how hero solve and finally survive him and his family neighbours also .movie is an horror action scenes are super to watch . after a long back an action horror moive siddarth as (krish)and heroien andrea as (lakshmi)wife and husband loveble couple ,and one family has come beside as nieghbhours ,in that family jenii as spirit of devil insist her ,jenii was trouble all tha family numbers and krish family also .how krish managed and survived from that devil is the moive . The Horror Movie Has A Message About The Girl Child, But The Chinese Angle Does Not Gel With This Story..
Gruham' Is Visually Pleasing And Technically Cut Above The Rest. The Performances Are True-blue. But If You..
‘Gruham’ Is A Well-made Horror Thriller With Some Generic Elements. The Himalayan Setting, Some Spooky.. The Film Is Serious And Definitely Not For The Weak Hearted. There Are Some Gruesome Disturbing Images That..
All In All, Gruham Oozed In Some Freshness For Horror Movie Lovers. For Followers Of International Cinema,..
On The Whole, Gruham Is A True Blue Horror Thriller Which Is To The Point. There Is No Unnecessary Hungama In..
Siddharth Q&A | Gruham Telugu..
Gruham Telugu Movie Trailer Launch..